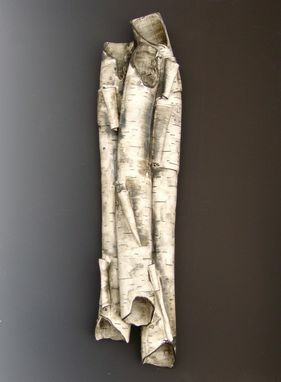 High relief wall sculpture in a birch motif, comprised of porcelain with multiple layers of terra sigillata and stains. This lyrical composition offers an interesting visual perfectly soothing for a practitioner's office or waiting room. Think of these sculptures as a solution for a vertical space, in groups, or stacked on the wall in a totem-like arrangement. One could think of the style from modern, a wonderful punch of texture to a start environment, or in a more rustic setting.